da Via Italian Market Eating, Dunwoody GA (CLOSED) – Marie, Let's Eat! Occasionally, we will attend a media event and the organizers will give us some proper, professional photos. We never use these. You probably figured that out, right? Well, earlier this month, we were invited to the opening of da Via and oh, my heavens, what came out of my camera made me weep. This is a really nice new place with very flavorful food and a lively, fun attitude, and we’d kill the place stone dead by using the mess that I shot. Honestly, if we had come to this restaurant on our own, I wouldn’t post any pictures at all. Well, the one of the wall. But since they were kind enough to give us pictures, here, look at these very nice shots of food that we did not actually eat ourselves. Wouldn’t it be great if our blog always looked this good? Doesn’t this make you want to PayPal us about a thousand dollars to buy a new camera and some photography classes? 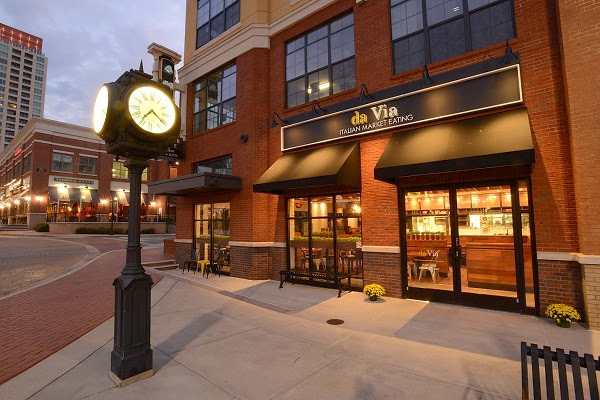 da Via is a new fast casual concept from a European company called AmRest. They introduced a restaurant called LaTagliatella to American shores last year and reviews have, charitably, been mixed. The local team at this restaurant, however, which is located in Dunwoody’s Perimeter Place shopping center, is keen to stand apart from the parent concept and make their own splash. At this time, this store is the only one, although they hope to expand to other locations within Atlanta. They don’t currently plan to grow outside our metro area, making this an Atlanta-only treat for the time being. 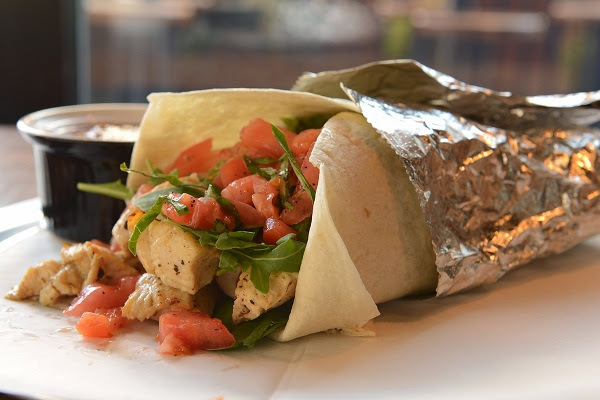 Like most fast casual restaurants, this uses the business model where guests go through a line customizing their order, adding meats, vegetables and sauces to burrito wraps called piadas, salads, or pasta bowls. Marie selected a bowl with spaghetti and meatballs in a pink rosa sauce, and I had a piada with meatballs and chicken with their spicy Napoletana. We joined Bella Vivere and several local muckitymucks, including the mayor of Dunwoody. This prototype store certainly doesn’t resemble the secretive, hidden-from-hype K Café, a prototype for a fast casual version of Krystal that was tested for a few months in Alpharetta and quickly scrubbed from sight. da Via wants to make a name for itself. They’re getting more right than wrong, we’d say. Some of the ordering process was a little confused, and nobody drew any attention to the baked-and-browned breadsticks with pepperoni, which I’d like to have tried. Selecting drinks between fountain Coca-Colas and a variety of canned Italian fruit sodas from a fridge behind the register is baffling even before getting the options of beer, wine, and Sangria. Fortunately, all the food is very good, save for the woeful, bland tortilla used to hold everything in the piada together. They talk big about the piada being Italian street food, tradition, culture, time of the Romans, and then give you the same cold and neutral floppy grocery store wrap used by every burrito joint in town. Frankly, the contents deserve better. So there are kinks in the delivery system, which you’d expect from a first-week launch. The food is what matters most, though, and it is very good. 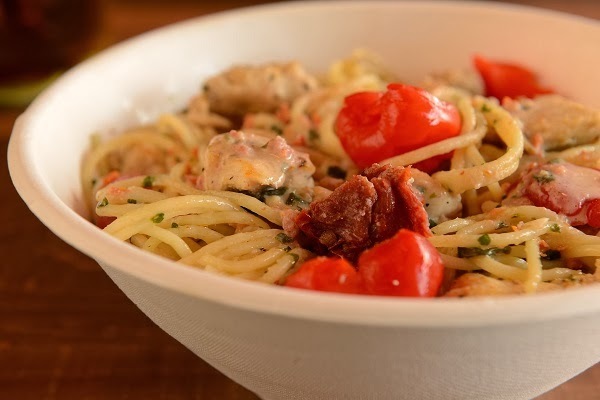 There are a few similar restaurants in the Atlanta area, but unlike, say, Figo Pasta, or Marietta’s Twisted Kitchen, the emphasis here is not on a laundry list of sauces and noodles, but on the high-quality vegetables and cheeses. Plus, while their competitors tout a huge number of sauces and the three here seem so few in comparison, they’re each really great. I like da Via’s attitude, reflected in a fun list of upbeat house rules that are printed on a wall and across the T-shirts of the staff. We were reminded of how the presentation of rules in any fashion can lead to a negative attitude and crankiness, but here they have a genuinely playful effect, not forced, but happy all the same. This is a fine, fun little place full of good food and good people. I wouldn’t mind another visit at all. Posted on October 27, 2013 August 8, 2017 by Grant G.Posted in atlanta, georgia, italianTagged atlanta, dunwoody, georgia, italian.